Samsung Notebook powered Sandy Bridge - SF311 Samsung Sens are now also available on the market Home South Korean company. 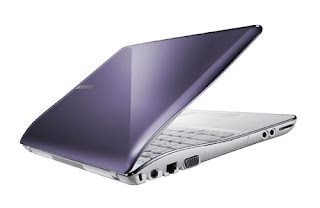 Samsung Sens Laptop SF311 is compact in support with Intel Core 2 processor generation from the company Samsung has exceptional features such as 13.3-inch screen with LCD technology SuperBright, 4GB memory, HD 1.3 megapixel web camera, 320GB hard drive, Bluetooth 3.0, WiFi, an Nvidia GeForce 520M with 512MB VRAM. Samsung PowerPlus technology provides up to 10 hours of battery life through 65Wh Li-ion battery, Available in White, Purple and Pink. Samsung Sens Samsung SF310 SF311 is the successor to that was launched last year. SF311 Samsung Sens Notebook will be available in April 2011. Using the discrete GPU will cost U.S. $ 1,337 and with integrated graphics cost U.S. $ 1244.